Noted author and urban theorist Mike Davis will present ‘A California perspective on Texas-as-the-future’ on Thursday, October 30, in Austin. 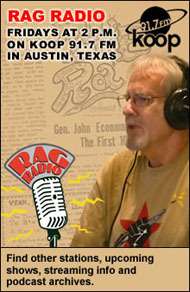 The Rag Blog presents Mike Davis at 5604 Manor in Austin. Photo © Don Usner. Poster graphic by Carlos Lowry / The Rag Blog. 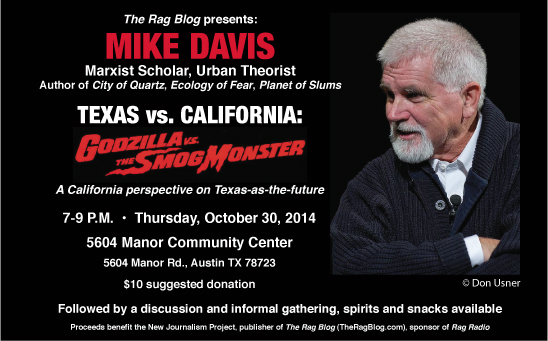 When: Thursday, Oct. 30, 2014, 7-9 p.m.
AUSTIN — The Rag Blog presents City of Quartz author, urban theorist, Marxist scholar, historian, and political activist Mike Davis — speaking on “Texas vs. California: Godzilla vs. The Smog Monster. 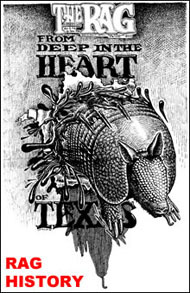 A California perspective on Texas-as-the-future” — on Thursday, October 30, 7-9 p.m. at the 5604 Manor Community Center in Austin. A discussion and informal gathering will follow — with snacks, beer, and wine available. The event benefits the New Journalism Project, the Texas nonprofit that publishes The Rag Blog and sponsors Rag Radio. Suggested donation is $10. Mike Davis, Distinguished Professor in the Department of Creative Writing at the University of California, Riverside, is the author of City of Quartz: Excavating the Future in Los Angeles, Ecology of Fear, Planet of Slums, and In Praise of Barbarians: Essays against Empire. Davis was named a MacArthur Fellow in 1998, and was honored for distinguished achievement in nonfiction writing by the Lannan Literary Foundation. City of Quartz was named a best book in urban politics by the American Political Science Association and won the Isaac Deutscher Award from the London School of Economics and has been translated into eight languages. 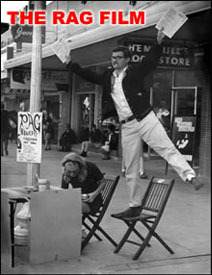 During a period in the late 1960s, Mike Davis lived in Austin where he was an organizer for the Students for a Democratic Society (SDS). 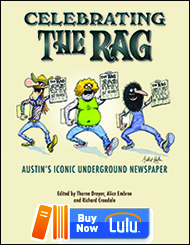 Mike Davis will also be Thorne Dreyer’s guest on Rag Radio, Friday, October 31, 2-3 p.m., on KOOP 91.7-FM in Austin and streamed live. The 5604 Manor Community Center is located at 5604 Manor Road in Austin. The event is open to the public. This entry was posted in Metro and tagged City of Quartz, Marxist Scholar, Metro Event, Mike Davis, New Journalism Project, The Rag Blog, Urban Theory. Bookmark the permalink.